October 17 – In a rare move Iran allowed women to attend Team Meli’s friendly with Bolivia on Tuesday in Tehran. Women have been banned from watching football in the country since the 1979 Islamic revolution. 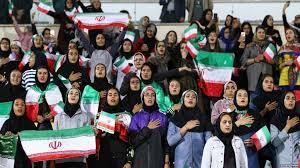 Local authorities deem the atmosphere at football matches too masculine for women to attend the games, but on Tuesday Iranian state-run news agency ILNA said about 100 women watched the friendly encounter from a women’s-only section in the upper stands of the cavernous Azadi Stadium. Multiple images of women watching, waving the Iranian flag and cheering inside the stadium later seemed to confirm the report. ILNA reported that the women had been selected to watch the game. The group included female employees of Iran’s football federation and members of the Iranian women’s national women’s team, along with female journalists and other women who were allowed to enter the stadium at the last minute. Earlier this year Iran detained multiple women who tried to attend the Tehran derby between Esteqlal and Persepolis. FIFA president Gianni Infantino attended the derby, along with Iranian Sports Minister Masour Soltanifar. At the time the FIFA chief addressed the ban in talks with the Iranian Football Federation, Soltanifar and Iranian President Hassan Rouhani, according to local newspaper Shahrvand. In recent years, women have been allowed to attend some men’s volleyball and basketball game in Iran, but attending football matches remains a deeply contentious issue. However, Iran international Mehdi Taremi had positive words about the presence of women in the stadium. “It should begin from somewhere, and this is a good start,” Taremi told ILNA.